For a variety of reasons I have not been anywhere near the blogosphere this weekend - chief of which is simply because I have been too tired. Friday was a particularly draining day; both mentally and physically and so the last couple of days, including my birthday on Saturday, have been spent relatively quietly. However, there was still the small matter of my birthday on Saturday to celebrate and so the family duly rose to the occasion in its usual inimitable style. The birthday present haul was a very satisfying one with the gifts of interest to readers being a number of Blu-rays including the extended versions of Peter Jackson's Lord of the Rings trilogy - over 12 hours of Middle Earth - and also the extended version of The Kingdom of Heaven, the crusader epic by Ridley Scott. As well as various consumables (one can never have too much chocolate in my opinion....) I have also received £75 in vouchers for Waterstones so the library will be receiving some TLC in due course. As far as the 42mm 1930s/WW2 project goes I was able to make some significant progress although not quite as much as I would have liked. The figures for the first batch of painting have been washed, cleaned up and based in readiness for the first round of treatment. This will be some form of sealer prior to being undercoated. I have more or less settled on the uniform schemes I shall be using and the style of painting I shall be employing. The three forces I shall be creating (the third has yet to be started) will use green, brown and grey respectively as the base colour. The paint style will be 'old toy soldier' as it suits the detail of the models better than anything more detailed. the only debate I am still having is whether or not to do anything with the bases. I am not sure properly textured and flocked versions would be within keeping with the tone of the figures and so plain and unadorned bases will probably be the order of the day. I will wait and see when the figures have been completed before I make a final decision on this one though. Similarly, I am undecided about vehicles and artillery but I will fall off that particular bridge when I get to it - after the first batch of figures are completed.. I have been off work today as my company gives you a free day on the occasion of your birthday (which is tomorrow) which was much appreciated. The day has been a tiring one though - not least of which because my son, SWMBO and I had to drive to Reading and back (nearly five hours for the round trip). I won't bore you with all the tawdry details but suffice it to say it was worth the trip and the outcome went a long way towards a particular goal. 4 x 8 figure sections, each of an NCO (Smg), 2 x Smg figures, 3 x Rifles firing, 1 x Rifle advancing and 1 x grenade thrower. I have yet to decide about artillery and vehicles although I have seen some rather cunning and top secret ideas currently in progress by a renowned fellow blogger. The organisation started out as mirroring that in Battle but as written these were intended for 1944 -1945 whereas I am looking at much earlier so I will have no need for rocket launchers. I have fudged the line up slightly to allow for HMGs and a Mortar at quite a low level but as we are missing LMGs this does not seem too harsh - fewer HMGS than LMGs seems better compromise in my opinion. I have been thinking about uniforms and have decided to go with green and brown as the base colours, one for each side and thinking ahead will use camouflage jackets for units designated as elite so they are easily identifiable. The next step will be ready the 84 figures I will be suing and so my plan is to have these based and undercoated before the end of the weekend. No prizes for guessing what my two choices of reading material currently consist of - the updated edition of Charles Grant's Battle and Three Weeks in November - the military history of the Swiss Civil War in 1847. Both have been very inspiring in different and occasionally similar ways. Battle has given me much to think about for my 42mm plastic WW2 project - both from the rules perspective and how I will be organising my collection. I am very fond of the rules and could easily turn them into a hex-based set for use with my Hexon set up if needed - I should mention perhaps that my original intention was to use a version of MOMBAT by Bob Cordery or even just go with Memoir 44 as they stand. Either way it is no big deal and I am quite relaxed about the rules side of the project. My initial forces for this collection will be fairly modest in terms of numbers and will equate to roughly a Grant sized platoon of around 30 figures. By careful choices in respect of figures this will also double up for any '4 figure unit' style games - such as the aforementioned MOMBAT or Memoir 44. I have settled on 30mm square bases for the figures and have a supply en route from Peter Pig. No mention yet of vehicles or artillery as I am still thinking about this. 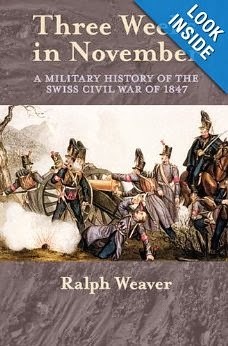 The Swiss Civil War of 1847 has really given me a lot to think about. Whilst I have no plans to refight this in its entireity I shall, after some gentle persuasion, fight a couple of the actions using the block armies - what I have in mind would make for an interesting game in any event. The main inspiration for me from this book though is the sheer potential from an imagi-nation perspective and also the way it has made me think about tackling a Napoleonic era set up along those lines. The uniforms worn are largely late Napoleonic in style and so producing armies would not be a problem using a selective repaint. I am not about to do this but it has made me think about how the concept of cantonal armies in the later part of the century - after the war of 1847 or, assuming that in never took place. With a little artistic licence with the geography - perhaps reducing some of the mountains and enlarging the lakes (one has to think of the naval dimension!) as well as combining the cantons into larger 'national' groupings you have a ready made area for fighting over. Allow the Austrian border to be disputed by the Turks so they have a presence (I simply could not leave them out!) and you have all the ingredients for something rather special and late 19th century. Today has been a pleasant day for a number of reasons. 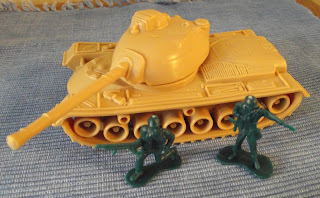 To begin with, I spent the morning at the Skirmish Plastic Soldier fair at Sidcup in Kent - originally planning to pick up some bits and pieces for my old toy soldier WW2 based collection. Despite some earnest rummaging I did not manage to get anything I set out to but I did come away with some cracking ideas that I will share in due course. I met up with some Skirmish stalwarts in the shape of Fran and Postie from the Rejects, Clint and Bob Cordery - with whom I spent a very pleasant half hour or so discussing projects many and varied. Bob was on fine form and regaled me with tales of his huge collection of Roco vehicles and the plans he has - as well as the Aladdin's cave that is his shed that, the contents of which are soon to be unleashed upon an unsuspecting public, once he has hacked his way, Indiana Jones-like, through the undergrowth to find it. Those very nice people from Pilum Painting were present, eager to chat and listen to me droning on about my latest bout of project insanity as was also Dave Lanchester of David Lanchester Military Books who, as usual, managed to have a couple of items I simply could not do without. Biographies of some of the leading personalities. Ron Weaver's book has them all covered and the colour plates are really good. The uniforms look like formal late Napoleonic types and there is plenty of colour to be seen as each of the Swiss Cantons had their own armed forces and uniforms. It would be easy enough to raise armies for this 'period' if needed but I have a rather different agenda with the contents of this book. There is much be inspired by - but to what end? Well, that is an easy one to answer. I have absolutely no intention of fighting the Swiss Civil War of 1847, not now, not ever but that will not stop me using this book as a guide to some central European 'imagi-nation' type action. Off the top of my head you could merge some of the cantons into nations, call the entire country a continent, flatten some of the mountains, enlarge the lakes so you could factor in the naval dimension and away you go! Now if only I could somehow add a Turkish frontier (possibly via Austria) this could work out rather nicely. Joking aside, the potential for me with this is rather alarming albeit in a good way. End of an era - or the start of a new one? I have been spending some time today sorting out the man cave and have decided that I am going to forego anything smaller than 20mm for my gaming. So my 15mm unpainted lead mountain is now surplus to requirements and some of it has found a home already! The ACW kit is next and I have already taken advantage of the free listing weekend on Ebay to stick the whole lot there. What does this mean going forward then? Well, the short answer is I am not really sure! Many of my games are happily catered for using the famous block armies but even I am not so soulless that I would forego using models entirely. The cheap plastic 42/45mm figures will certainly provide me with much to mess about with for 20th century games and from what I have seen even other periods could be tackled quite cheaply if one is not too fussed about detail and quality. Who knows - but something is beginning to itch. 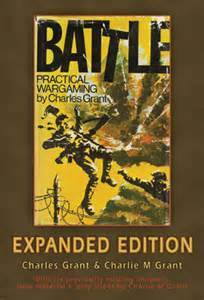 I expect that many wargamers 'of a certain age' are familiar with the original version of Charles Grant's classic book devoted to WW2 wargames. I have used these rules for probably more games than I can remember back in the early days of my wargames career and to this day I believe they are still a great set of rules. When Caliver Books announced that they were bringing out an expanded edition which includes some 6 chapters that never made it into the original I was intrigued. So intrigued that I decide to buy a copy. I am delighted that I have done so, albeit it with but a single reservation. I will not describe the book in detail as it is so familiar. The extra chapters are mainly devoted to the effects of terrain and the use of maps and so are very handy for completeness sake. You also get a couple of playsheets for the rules which are rather handy. The only reservation I have is the price - at £29.50 it does seem a little on the expensive side but I will enjoy it for all that. I recall the author's battle reports therein with some relish and the main thing for me in acquiring this book (aside from the sheer nostalgia value) is seeing the whys and wherefores of the rule mechanics being described in some detail - which is always helpful when writing one's own rules. Of the many desperate fights for control of the small Aegean island of Kalimtos the action at Aghios Margarita was by far the most vicious. A small British infantry force, supported by machine guns and mortars, was attacked from two directions by a vastly superior German battle group made up of elements of both paratroops and mountain infantry. The object of the German assault was the small village of Margarita with its dominating church. The village was unremarkable except that it was located along the main road to the coast and so would provide a convenient staging post for the German attackers. This was a bit of an experiment in that I fought the action using Bob Cordery's Memoir of Modern Battle rules (MOMBAT) but on a square grid rather than using hexes. I had set this game up a couple of weeks ago for Bob's Morschauser based set but never got around to fighting it as planned and so I thought it would be shame to waste the set up! Victory conditions were as per Memoir 44 i.e. complete units had to be destroyed - I decided on 6 for each side. Memoir 44 combat dice were used to additionally decide which units could be activated each turn. Adjacent units could 'battle back' if still in place after close range combat i.e. not destroyed or pushed back. Units were allowed the use of a single diagonal when moving or measuring ranges which counted as one. The opening dispositions. The British had occupied the town with the command, the mortars, a machine gun and an infantry unit whilst a single infantry unit deployed in the small walled enclosure to the south and the reaming troops, with a machine gun, took up a position on the hill to the west. The Germans were attacking from the east and the south west, their approach being shielded by the low hills and small copses of pine trees. Turn 1 saw the Germans advance from the East and the central unit was promptly plastered with mortar fire. Turn 2 and the Germans continue their advance. The northernmost unit came under rifle fire from the town and suffered casualties as a result. Turn 3 saw the German attack run into fierce resistance with the unit in the north pushed back with casualties, the unit in the centre was destroyed by machine gun fire and in the south a telling and accurate round of rifle fire virtually annihilated the luckless infantry assaulting the walled enclosure. Turn 4 and the southernmost German unit meets in nemesis beneath the walls bristling with Lee Enfield rifles. The Germans fought hard and to the last as the British suffered their first casualties of the day. Turn 6 sees the German survivors in the north finished off at long range whilst the British mortars continue to plaster the hill and causing losses to their opposite numbers, trying gamely to salvage something from the situation. The German attack from the east has been roundly defeated - but what of the west? Turn 7 and the Germans in the south west make some telling progress as they attempt to outflank the hills and enter the town from the west. The British infantry in the walled enclosure leave the safety of their position in an attempt to support their comrades in the west - with disastrous results! Turn 8 and the outlying British forces fall back to the town with the Germans in the west in ragged pursuit. Turn 9 and the sting in the tail. Although the British have been battered and are being chased into the town they are still able to inflict telling casualties on their pursuers. Turn 10 and the remnants of the German assault force hastily reorganise themselves prior to rushing the town. Their casualties have been horrendous so this last assault is critically important. Turn 11 and the Germans have almost cleared the way into the town. One of the British machine guns and the mortars have at last been silenced and victory is in sight! Turn 12 and a knockout blow! The sole remaining British machine gun opens fire at point blank range and scythes down the attacking Germans at the entrance to the town. This is the final straw as it was the sixth and final German unit destroyed and so the British had held on. The final score was 6 - 4 to the British. The action worked surprisingly well and considering that a number of the mechanisms I was using were very much by way of experiments this was perhaps surprising. I was particularly pleased with the 'one diagonal' rule which made the effect of the square grid far less noticeable. The battle back rule worked very well and this I will certainly keep for future use. The only thing that I am leaning towards is the Command and Colours Napoleonic idea of using the number of blocks/bases/figures in a unit as being the determining factor in respect of the number of dice rolled. That will be something to ponder going forward though. At a personal level this was the first game I have fought for a while and very enjoyable it was as well. It more than made up for the disappointment of a couple of parcels recently delivered that are both wrong for a variety of reasons and have needed to be sent back/reordered. I have also made a promise to myself that I will play another 10 games before the end of the year so that I would have completed 52 in two years or one a fortnight. Its a tank, honest - with a couple of figures for comparison. I had planned to have a game this weekend - honest. Events have conspired against this happening but it has been a pretty good weekend all said and done. Aside from the goodies of yesterday I managed to get to the cinema to catch the film Elysium. It was not bad and had some nice ideas but it felt a little 'light' in terms of the characters for me. Worth seeing if you get the chance though as visually it was very impressive. Seen the film, hummed the theme tune - now own the book! This morning SWMBO and I managed to get to our local (and very small) boot sale - the fruits of which are shown in the pictures. I am a great fan of Cornelius Ryan and his book on Operation Market Garden - A Bridge Too Far - is one of my favourite books on the campaign. 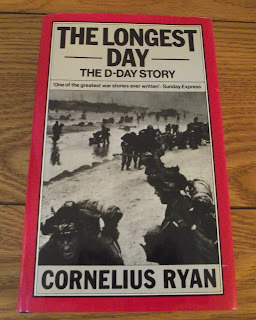 I have not read the Last Battle yet - the fall of Germany) but I do own a paperback copy of The Longest Day - the D Day story. Seeing a hardback edition of this title available for 20p needed no hesitation on my part to fish out the coins and acquire the book in very short order. Following on from Anthony Beevor's title on the same subject you could be easily forgiven for assuming that a Normandy-based idea was in the mix but I can happily refute this! No plans, no time and certainly no inclination for the foreseeable future! The tank was picked up more by way of an experiment than anything else but I am glad I did. It fits in with the figures I have very nicely indeed (although slightly under scale by comparison) and so the plan is to acquire more of the same and substitute the appropriate paint job where needed for the nationalities in question. The Skirmish show at Sidcup in two weeks can't come soon enough! For the record, the tank was a mere 30p. The second issue of the Star Trek model part work appeared in my local supermarket today and taking advantage of SWMBO's staff discount I promptly purchased it! 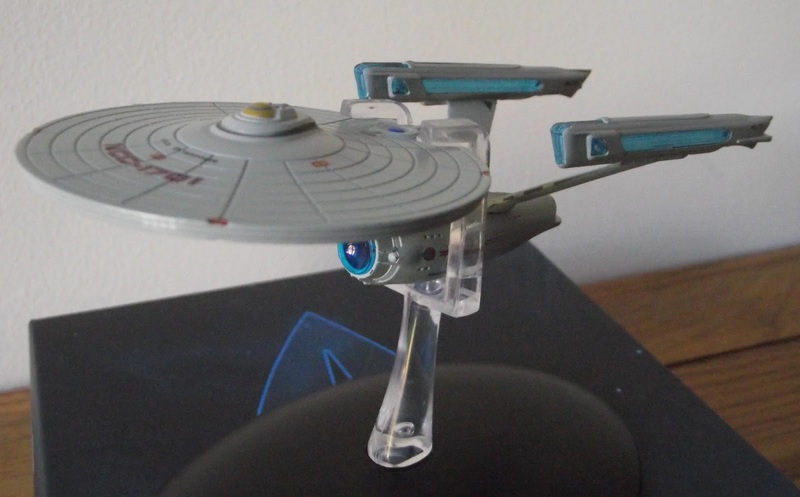 This is the movie Enterprise and although slightly larger than the original TV version (by around 14m according to the magazine) it is roughly half the size of the Enterprise D. Here we have the usual 'scale the model to fit the packaging' arrangement as strictly speaking this should a lot smaller but in fact is the same size as the model in issue 1. I really do not care - the detail of this model is quite simply superb! I am not struck on the basing method employed but am loathe to start drilling holes in the metal hull. The next issue sees the Klingon Bird of Prey which is also on the list of models to acquire but I am really waiting for issue 11 - U.S.S. Reliant. The curious parcel of the title of this post arrived this morning courtesy of that very nice chap, Tim Gow. He very kindly sent me a number of figures to go with the planned Plastic Army Men set up. I am undecided as to what I am going to do with them but am sure they will come in very useful so many thanks to Tim for them. 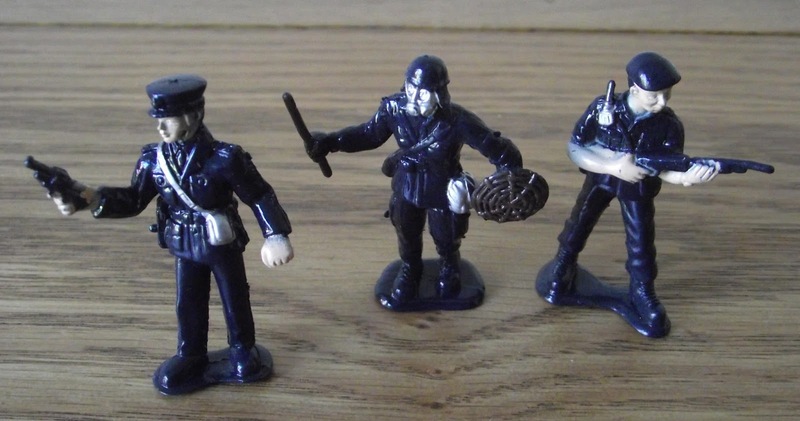 I like the fire brigade/highway construction types and the police officer with a pump action shotgun is a great looking figure - military police perhaps? 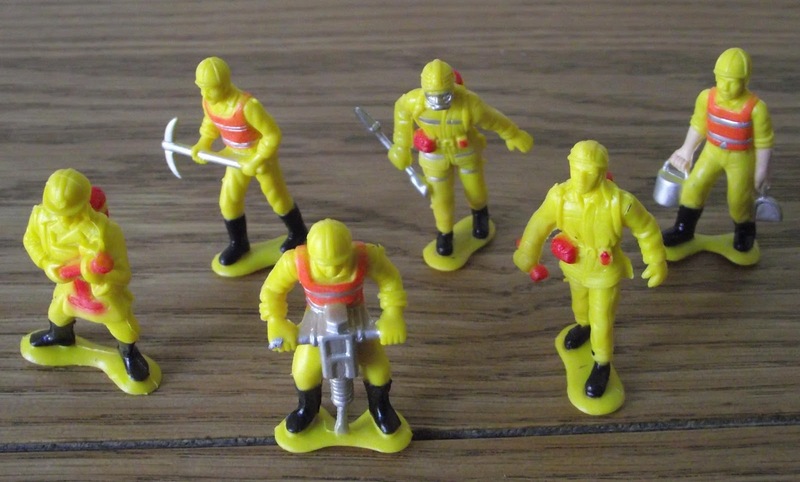 The figures appear to be made from a rubber type material rather than the more usual plastic but that is nothing that several layers of PVA and varnish can't cure! Many thanks once again to Tim for the figures - they are much appreciated. 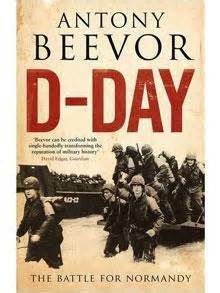 I have owned this book by Anthony Beevor since publication but have only recently gotten around to actually reading it! It has been my travelling companion for the last week to and from work and what a thrilling read it is. The overall story of the invasion and Battle for Normandy are probably pretty well known amongst the gaming fraternity - even if WW2 is not your period of choice - and so a detailed review of the campaign by me is pretty pointless. The thing that has really captured my attention about this title (and I suspect the more knowing readers of this blog will have their own take on this) is the sheer scale of what almost went wrong/right at key moments for both sides. 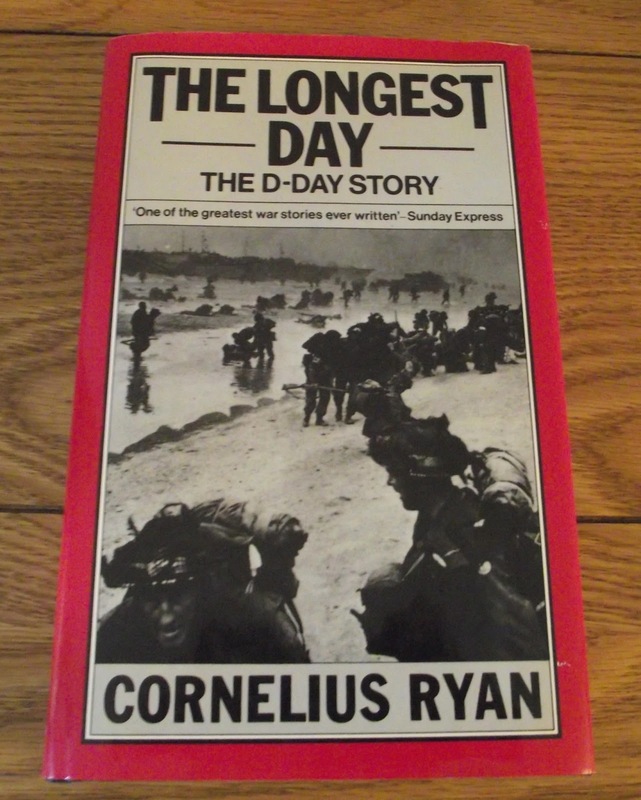 It is a good read to get under the drain covers of most of the D Day/Normandy 'sweeping statements' usually associated with the campaign. Many things struck me whilst reading this book such as the sheer level of carnage inflicted on both sides and how quickly formations could be rendered unfit for action due to casualties, lack of supplies and lack of recovery time. I was also surprised by the level of attrition sustained by the British and Canadian forces. Air power comes across as hugely significant but not in the way I imagined - it seems that the Americans got the concept of close air support worked out far sooner than the UK did although the RAF caught up pretty quickly! I heard the news first thing this morning and it has stayed with me for the day. I never met him but I did buy a copy of his WW2 rules (inscribed by the author - as they all were during the Wargamers's Newsletter days) during my formative years but never really used them. I owned a copy of Battles with Model Soldiers which I really enjoyed but my favourite chapter of his was his description of how he home cast a 19th century Austrian army and painted the same whilst watching the Olympics (1968 I think) - and I cannot remember which of his books it was in (I think it was Advanced Wargames). During the period of my robust, pugnacious and arrogant youth I never gave his books more than a passing glance as I felt that I moved in far more sophisticated circles and so the rules I used reflected this. His output seemed to be the product of a bygone age and was not really what I wanted. I spent some 20 years playing around with rules that I am quite sure he would never have bothered with due to their complexity and seriousness. I missed out on the recreational aspect of our hobby by assuming that complexity would provide a better challenge and more appropriate way to spend my time. I was wrong, hugely so, but it has taken me a long time to realise that chaps involved in all those grainy , black and white pictures that look so quaint had the right answers about our hobby all along. Our hobby is fun, and should be treated as such because at the end of one of our 'battles' nobody has died. I have a a couple of his books in my collection and fully intend getting some more in due course. The games he fought seem simple by today's standards but behind the basic d6 driven ideas and using paper squares for parachute drops lies an understanding of what the all important 'feel' of a wargame should be. If you like - Art, to be appreciated for what it appears to be rather than science making it a cold and sterile experience; cold and unfeeling and reduced to mere numbers. In closing I will say only this - the influence that he has had on my gaming has not been obvious in the short term but only now do I realise the impact of what he has achieved and how much I now realise that I owe him because of it. As, I suspect, do many others reading this blog and others like it. R.I.P. and thanks for the memories.